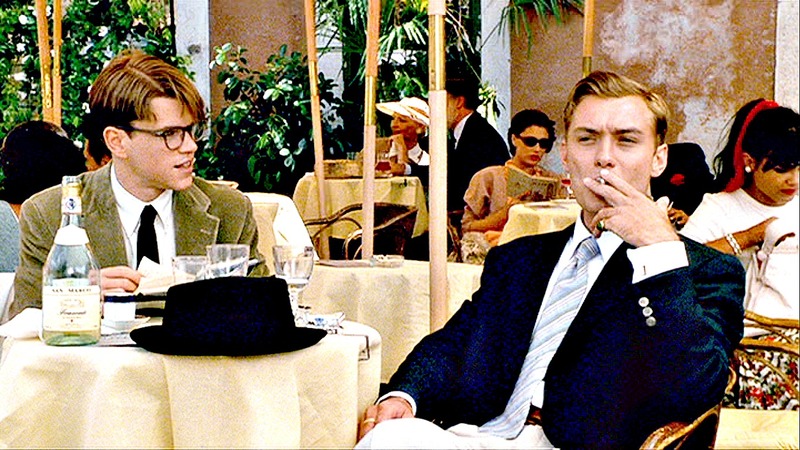 In a wonderful conversation with my friend Gretchen, we discussed The Talented Mr. Ripley (based on Patricia Highsmith’s novel by the same title). This is one of those rare films that I wish more people referenced – or at least knew about. To date, it’s one of my favorite movies, so rich with aesthetic beauty and profound characters (and so thrilling, too) that I take something new from it with each re-view. When its director Anthony Minghella passed away in 2008, I took notice. He was still relatively young, and his career felt unfinished. I mourned the loss, though I had only seen two of his films – Ripley and The English Patient. I heard this commentary just once, and over seven years ago. But that particular insight, among so many others on his commentary track, stayed with me. It stayed with me because at first, I didn’t understand it. It was not how I characterized the central friction between Tom and Dickie. Minghella’s words haunted me, and I did not know why. In recent years and months, I’ve had many opportunities not only to rewatch this film, but also to revisit Minghella’s piece of wisdom. Above all, I wanted to know: Am I Dickie, or am I Tom? Are people, places and things in my life easily replaced, or irreplaceable? Do I trade one moment for the next? Do I graze the outer shell of emotions, or do I embrace them at every coloration? Do I enjoy things at their surface, or do I immerse in their depth? Am I within? Am I without? Do I pleasure, do I suffer? Probably, I am – and do – both. Even Minghella seems to suggest that Tom and Dickie, at their most fundamentally different, sometimes bleed into one another. That even Tom and Dickie are sometimes Dickie and Tom. Because Dickie feels deep pain and has introspection. Because Tom will kill even those who love him to protect a surface life. We are never so cardboard that we don’t bend and break our own fibers. We are never so ourselves that we don’t become other people. But, in an effort not to dodge my own question: I suppose I am more Tom than Dickie. (Cue ominous, murderous music.) I suppose the depth at which I think about relationships and objects and places puts me at an emotional disadvantage, because I love more than I like, and what I think something is worth is often more than what it wants to be worth. My world within is rich, but my richness within is often unmatched by the reality without. Its fantastic as your other blog posts : D, appreciate it for posting . “Love is like an hourglass, with the heart filling up as the brain empties.” by Jules Renard. Pingback: Four Films to Watch Before the End of Term – RAZZ.